This book is about the two tribes of Washington, D.C.: Democrats and Republicans, whose members include lobbyists, Wall Street, and the military-industrial complex, among others. The tribal leaders are rich old men, and one byproduct of that culture is a system in which the NFL is allowed to operate as a nonprofit organization -- despite revenue of $184 million and $1 billion in assets -- while paying $11.4 million in compensation to its commissioner. We have a tax system where workers' income is taxed at a higher rate than the nonworking income. Moreover, Congressman Peter Stark, 80, who is worth $27 million and earns $174,000 a year in addition to his Social Security benefits, gets additional checks from the Social Security Administration to care for each of his three children until their 18th birthday. If you think there is something un-American about this picture, then this book is for you. 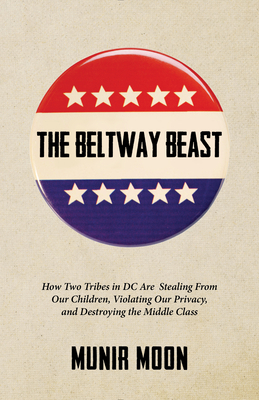 The Beltway Beast documents our current reality and calls for real competition in electing our leaders and transforming our political, healthcare, and tax systems. In every crisis there is opportunity, and this book is intended to mobilize main street America to take back the country. Prosperity will come back once America gets detoxed from the addiction of stealing from its children and living beyond its means. Munir Moon is a social entrepreneur and a former financial industry executive, is currently president of Bertech-Kelex, a Southern California-based distribution company that has been recognized three times as one of the top 500 fastest-growing small businesses by "Inc. 500." In addition to his business background, Moon has nearly three decades of personal experience with our healthcare system because of the medical needs of his younger son, who survived a rare childhood cancer with numerous surgeries and is wheelchair bound. His writing frequently appears in "The Huffington Post" and other publications.